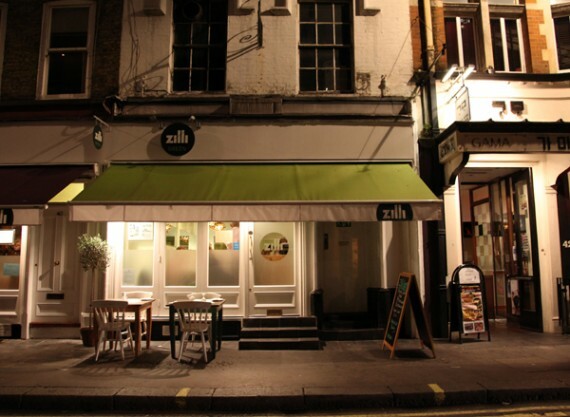 zilli green is an all vegetarian restaurant with a very vegan-friendly menu that opened in london earlier this year. it was started by aldo zilli, an italian celebrity chef who holds the world record for the most times a pancake has been flipped in one minute—117 times! of course we had to check this place out. i must say that after having some incredible meals at other vegetarian restaurants in london, this one left me feeling a little underwhelmed. we started with an order of bread, which was lovely. 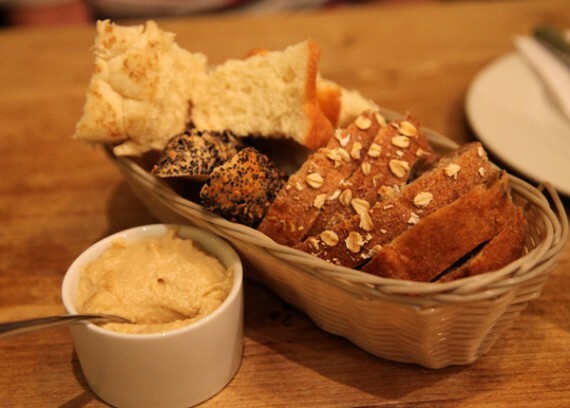 the appetizer came with 3 types of bread, olive oil, and hummus. no complaints! 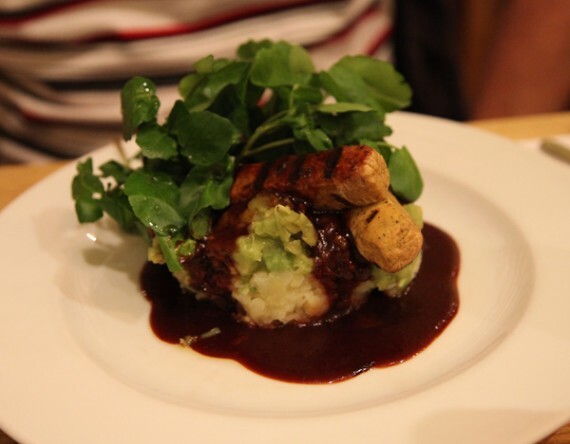 my husband and i decided to order 2 entrees and share them, beginning with zilli green’s vegan version of the british classic bangers and mash. this came with two tofu sausages, spring onion mashed potatoes, mushroom gravy, and mushy peas. i just gotta say, it sounded a lot better than it tasted…and wasn’t really worth nearly ₤12! the sausages tasted like store-bought redwood foods variety (which is great, but not at a fancy restaurant). the mash was really good, but the gravy was way too sweet. overall, this dish was just kind of meh. 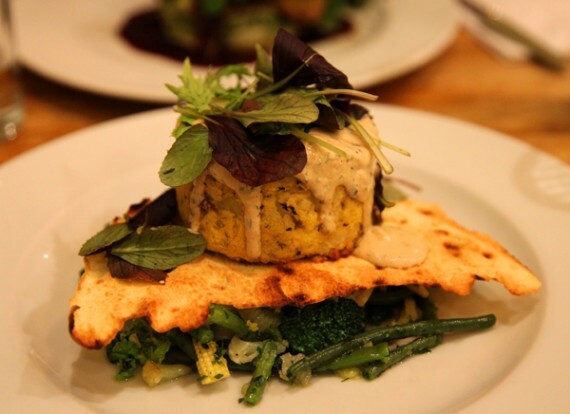 our next entree was a seasonal item which isn’t on the zilli green menu at the moment: a tofu cake with greens, crostini and sauteed vegetables. i’m pretty sure this was around ₤12 as well, and i must say it was way better than the sausages. it was covered in a super creamy and delicious sauce, and the tofu cake itself was wonderful. my only complaint is that the vegetables were limp and tasted as though they’d been frozen and reheated. at these prices, i want fresh vegetables, dammit! 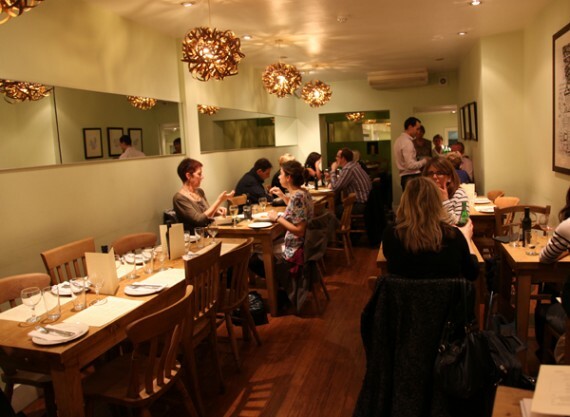 inside, zilli green is like most upper scale restaurants in london…packed! the tables are little and close together, and if you go in the evening, you should definitely make a reservation. it’s got a great location in soho, but with mildred’s so close by…i don’t think i’ll ever go back to zilli green as a tourist. maybe when i live in london someday, i’ll give it another shot! PS: don’t get zilli green mixed up with the other zilli restaurants. i’d hate for you to wind up at zilli fish by mistake! Haha you beat me to it! Forget Aldo (sorry fella), the main man is Enzo, who makes/made Inspiral Lounge what it is/was. I’ve had a couple of issues with them before, such as over salted food. But the last time I was in London, Aldo greeted me as a friend and ensured all went well. I have to say, the best dishes to eat are the Italian ones. No surprise. Try the porcini with fresh pasta. Out of season it’s frozen porcini but it is still outstanding. The deserts are outstanding too btw! @da data monkey: funny you say that, because our food was over salted! It’s a double dip. The sous chefs salt, then Enzo does too before it hits the pass. I have told ALdo!! These meals are pretty much twice the price of the stuff you have in LA. I wish London had better vegan food. Everything I’ve tried here is overpriced and average. I was wondering how this was. I will be doing some work in Soho later this year/next year and have been compiling my vegan/vegan friendly list near Soho/Mayfair. Now I have the 411, thanks!